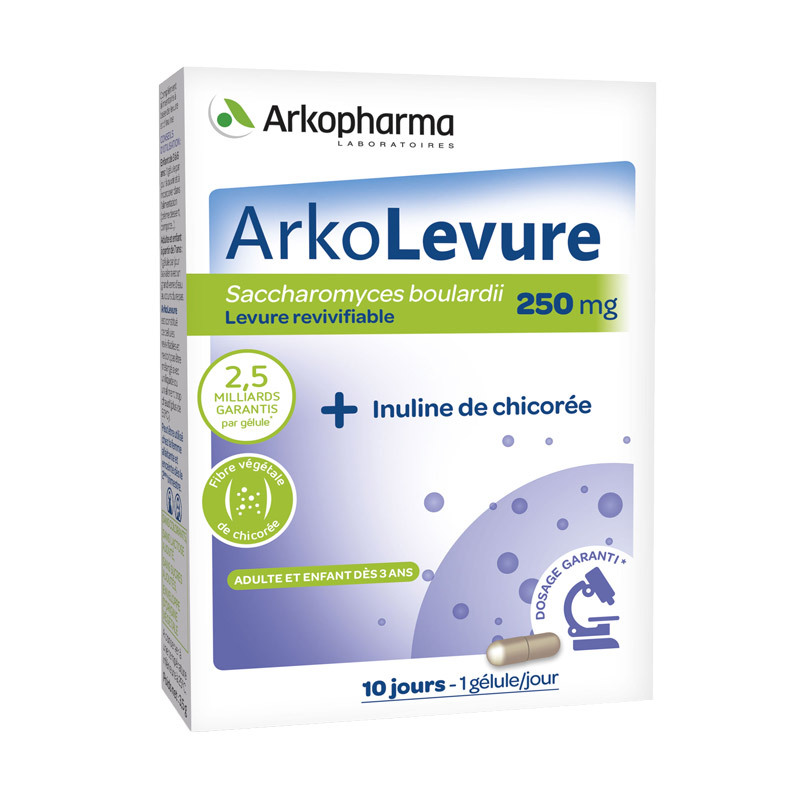 ARKOLEVURE capsules Arkopharma Laboratories, will help to balance and maintain intestinal flora, so that it recovers its natural defenses, thus strengthening the immune system of the body. The intestinal microbiota, is composed of a set of microorganisms, through which are beneficial bacteria in the digestive tract, from the stomach and intestines. All these bacteria will be perfectly synergistic to multiply them and neutralize pathogens and harmful to the proper functioning of the intestinal flora bacteria. You should know that a good bacterial growth and an optimal balance of flora, helps maintain and preserve the immune system of the body to fight various external attacks. One capsule contains 250 mg of Saccharomyces boulardii, are live micro-organisms that improve the health and well-being by balancing intestinal microbial bacteria necessary for proper functioning of the intestines. One capsule contains 90mg of inulin. This item is from the chicory plant, which provides a prebiotic action to stimulate the growth of necessary and beneficial intestinal bacteria functioning. The capsules are probiotics that will maintain the balance of your intestinal flora and help strengthen the immune system of your body. Children from four years: Dissolve the contents of one capsule into a glass of water, yogurt or applesauce, once a day. Adults: Take one to four capsules daily with a full glass of water. ARKOLEVURE capsules are nutritional supplements and should not replace a varied and balanced diet coupled with a healthy lifestyle.